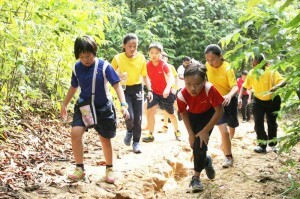 The Surian Cross Country is a staple event of R.E.A.L Schools, Cheras Campus’ calendar and has always been an eagerly-anticipated one every year. The latest edition, held on 20th February 2017, was no different; as students from both the campus’ National and International schools converged to join in the fun and test their physical prowess and endurance. With many ex-students and members of alumni also participating and lending their support to the event, the sense of energy and enthusiasm was definitely palpable and infectious. The sight of the students donning the colours of their respective Sports Houses; namely Yellow, Green, Blue and Red; only heightened the atmosphere and anticipation further. Participants assembled at the school field early that morning, waiting anxiously to test themselves against their peers. From this starting point, the course gradually took a challenging turn as the students ran along roads, navigated their way up a hill and passed through a housing estate. Exhaustion was only matched by pure adrenaline rush pumping through their veins as well as sheer persistence and determination to cross the finish line first. The students’ spirit and sportsmanship were clearly evident throughout the run. Despite the arduous physical and mental challenge of the run and testing obstacles along the way, everyone was seen supporting and encouraging each other to keep going. The ever-ready St. John members and Scouts who were on duty were also on standby to assist when called upon; rendering help and medical attention to those in need. In short, everyone played their part in making this event a success. 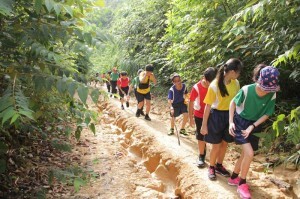 Once more, the Surian Cross Country lived up to its billing as one of the most popular school events of the year; made even more meaningful by that fact that students of both National and International schools once again united under one single community; that of R.E.A.L Schools, Cheras Campus. After all, bringing students together and instilling within them the spirit of teamwork and collaboration is what such extracurricular pursuits at R.E.A.L Schools are all about. The post Cheras Campus Cross Country a ‘Runaway’ Success appeared first on best international schools in malaysia.